I came to know the Lord in a real and life-changing way at age 13. But as I've mentioned before, it took me a few years to really figure out what it meant to be a DISCIPLE of Christ. And I'm still learning. Mentors can make a huge difference in the growth process of young believers. And God designed this mentoring process. 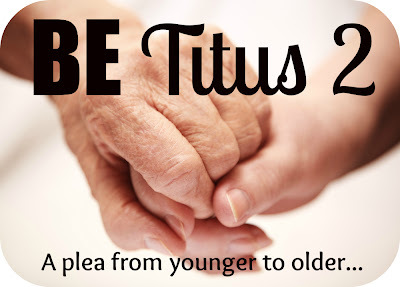 Titus 2 is probably the most hailed of the passages in the Bible that speak to older believers teaching younger believers to live as true disciples. "But as for you, teach what accords with sound doctrine. Older men are to be sober-minded, dignified, self-controlled, sound in faith, in love, and in steadfastness. Older women likewise are to be reverent in behavior, not slanderers or slaves to much wine. They are to teach what is good, and so train the young women to love their husbands and children, to be self-controlled, pure, working at home, kind, and submissive to their own husbands, that the Word of God may not be reviled. Likewise, urge the younger men to be self-controlled. Show yourself in all respects to be a model of good works, and in your teaching show integrity, dignity, and sound speech that cannot be condemned, so that an opponent may be put to shame, having nothing evil to say about us." Here, Paul instructs older men and women not only to live as godly examples but to be active in the growth of the young in Christ. From Paul's perspective, you couldn't be one or the other. You couldn't just be a silent role model, but you couldn't just be a teacher who doesn't really live what he's teaching either. So why do we think that we can abandon the original intent of Paul's writing today? Granted, I have met a few older men and women who do both - they live passionate lives for Christ WHILE teaching others to do likewise. But they are a RARE few. Thankfully, several of those few attend the church I currently call my home. And our congregation was blessed to hear from some of them during our "Women's Ministry Moment" this past Sunday. But having lived 34 years, many of them in the "Bible Belt" (Georgia, South Carolina, North Carolina, Kentucky, and Indiana...okay, so Indiana is more like the shirt above the belt! ), I have found these types of true Titus 2 men and women definitely to be in the minority. Having almost completed a seminary degree myself, I am often called on to play the part of the "older" woman in people's lives. And I'm blessed to do so. I don't believe the Titus 2 passage speaks exclusively to age but rather to experience/growth in the Lord as well. So I pray daily that I would be the kind of woman that the younger generation can look to as both a disciple and a discipler. But I am constantly "on the hunt" for women who are several steps ahead of me...women who have lived beyond my years who can speak back into my circumstance. I want to BE mentored just as much as I want to mentor others. And I know a lot of other "younger" women out there who want that as well. So I am making a plea on behalf of the younger to the older: BE Titus 2. We the younger generation implore you, "Do not go gentle into that good night...rage, RAGE against the dying of the Light!" (poem by Dylan Thomas, emphases mine). Live for Christ with every ounce of your being. Die to self daily. And pass on the lessons you learn WHILE learning them. We long to glean from your experience in the Lord! Thanks, Britt! I'm so glad to be partnering with you in discipleship and ministry. YOU encourage and challenge me. Thanks SO MUCH for that, girl!